Boston, MA - President Obama, in New York to raise campaign cash, told a group of prospective donors that ‘We don’t compromise when it comes to Israel’s security.’ That would be great news, if it were true. Unfortunately, under the Obama Administration, U.S.-Israeli relations have hit a low not seen since the Jimmy Carter years. It is not merely the way that President Obama has disparaged Israel’s prime minister in public and private. U.S. policy itself is at issue. Whether the question is peace talks with the Palestinians, or defining Israel’s borders, or keeping Iran from getting nuclear weapons, the administration has repeatedly scanted Israel’s interests. Words uttered behind closed doors in a campaign fundraiser in New York are one thing. Actions that have repeatedly thrown Israel under the bus are another. President Obama's foreign policies have not improved relationships with old enemies and with old friends. His behavior has been consistent and without gain. One wonders if he has an agenda which is not transparent. New Yorkers can, however, take pride in their efforts to Mrs. Clinton an important political figure. PMO will say "Wow, I can't believe that the Republicans are looking to nominate a flip-flopping liar like Romney. He's not a true intellectual conservative. See how he lies about Obama's position?" Sherry the Noachide will say "I can't believe that you Jews actually believe what these right-wingers are saying. Right? LOL :-) haha! (((:PPP Everyone knows that Obama loves the Jews and Israel at least at much as he loves Muslim dictators, and that's a whole lotta love. Get it? LOL!!! Stop with the hate!! :0))"
And there will be the many anonymous posters who keep changing names, so nobody can keep track. Of course, my opinion is that knowing how Romney operates, he only said what he did because he did extensive polling and he knows that many people agree with him. Well - Mr. Romney is irrefutably correct! That's a witty post, MidwesternGuy! I don't much care what some nohide shiksa has to say, but PMO is probably a jew and calls himself an orthodox and a conservative (politically, that is). Go figure. I am with you; Romney is not my first choice, but apparently an inevitable nominee, so for the next four years we are stuck with the president of somewhat elastic conservatism. Ok, but consider the alternative: the abomination occupying the White House presently. as long as you ignore the facts, you are irrefutably correct. Unless, however, you consider opposing Palestinian statehood at the U.N, reaffirming Israel's rights to secure borders, and asking for increased sanctions on Iran against Israel's interest. Somehow, I find actual facts more compelling than false Republican talking points, though it is definitely much easier to repeat the slogans that you hear from the media than to do your own research. facts r facts - if we would list all the "threats" and comments Obama made about/against Israel and Bibi they would almost equal those of the Palestinians themselves. 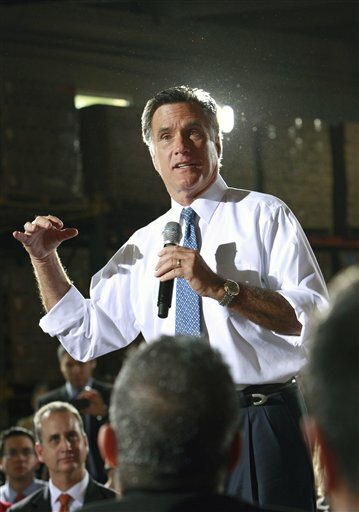 Romney's only tactic against the Obama campaign: Clear the way I am going to throw some mud on Mr. Obama! Wow. I cant wait! “ That's a witty post, MidwesternGuy! I don't much care what some nohide shiksa has to say, but PMO is probably a jew and calls himself an orthodox and a conservative (politically, that is). Go figure. "I don't much care what some nohide shiksa has to say..."
You kiss your mother w\that mouth? You left out ALL of the parts about what a ridiculous flip-flopper Mitt Romney actually *IS* because you'd rather not talk about THAT, and would rather poke fun at other posters instead! One of them is the biggest flip-flopper in the history of politics, and Gingrich.. *sigh* Ah, Gingrich. I don't think I've got enough ROOM here on VIN to post all of his baggage! So what of THESE people Midwestern? We all get how you feel about Obama... but seriously... what are you going to do?! Seriously vote for people like Michelle Bachmann? Donald Trump? Rick Perry? So you're all digging your OWN graves, by even considering putting crazy people like these into office! But... you LOVE your country, right? (lol) Sometimes I wonder! Obama has no credibility whatsoever! Remember how people would call Bush "a bumbling idiot"? So they voted a speech-making lecturer instead. Talk about a bumbling idiot. Obama is the problem! Vote him out! You do understand that, under the Constitution, Obama can send proposals to Congress, but only Congress has the authority to approve the budget? And, if you look at their record, since the Republicans have taken control of the House, they've taken large amounts of vacations and voted no on just about every single budget proposal made by the President. They even caused the US credit rating to get downgraded by their stance in raising the credit limit. As Mitch McConnell publicly stated, his number one goal in the Senate is to make sure Obama doesn't get re-elected (meaning it is NOT trying to solve our economic problems). Does this make Obama the bumbling idiot, or perhaps the people who voted in representatives who intend to destroy the economy so they can win the next election? Look, this is not rocket science, if you are extremely happy with the way Obama has run America in the past 3 years then vote for him. Do you believe the economy, jobs, housing, bi-partisanship, international relations have been better over the past three years...then vote for Obama again. Is Israel more secure, safer, closer to a future of peace with their Arab neighbors due to the progress of the Obama administration? If you believe so then vote for Obama. If you want more of the same...you will get it! Well said, Marcia. Thank you! But don't forget to say that the Dems had control of the House & Senate so there's no reason they couldn't "improve" the economy if they knew how to! uh, they did. In case you have poor long-term memory (or get your news from Fox, which recent studies makes you less informed than people who don't follow the news), the economy was near collapse at the end of the Bush administration. In the last Bush term, there was a loss of jobs (-.85%); to date, under Obama, an increase in job creation of +.65%. For the math impaired, that is a net gain of 1.5%. The non-partisan Congressional Budget Office determined that the Obama stimulus plan increased job creation and boosted economic growth. Economists (including many conservative Republicans) have stated that Obama averted what could have been a Second Great Depression. Then, the Republicans took control of the House and started voting NO to everything (that is, when they weren't on vacation). Now, they're opposing continuing a middle class tax break to be paid for by a small increase in tax on the second (and greater) million dollars of income of the rich. You vote against your own self-interest and them blame Obama! “ "I don't much care what some nohide shiksa has to say..."
....he didn't TYPE anything that could be perceived as having a potty mouth. And shiksa means non jewish woman...so um...whats the problem? It's the general lack of respect that people have for ...well... everyone else on here! It's the constant name-calling, it's the constant barrage of attacks against me JUST because I'm a gentile. Somehow that ALWAYS has to come up if somebody's irritated. Or, if G-d forbid a Jewish person is a Progressive or Liberal... I see them get attacked & called a "self-hating Jew" & G-d knows what else! I'm not sure what people's problem is... but all I know is this: we all love the Torah, we all love our G-d, and we all know what's right & what's wrong. And I'm not sure how people can feel comfortable living w\themselves, when they know they come online & berate other people's wives, their fellow brothers & sisters, etc.! I mean, where's the love?! (lol) It's one thing to argue about politics, say somebody is way off base, or that you don't agree, etc. But sometimes I feel like I'm in junior high again on here! Certain adults apparently haven't left the name-calling behind as they grew up! And I just don't see anything on here worth potentially losing your soul over, because you couldn't get along w\your (spiritual) family! It hurts HaShem to see His kids acting like this!